As with the earlier-documented 444, I am cheating a little with this; it’s not a pen at all, really. The model number describes one of Esterbrook’s “Dip Less” wells, and is in fact an older model with a simpler mechanism than the 444. In that example of the breed, the ink lives in a shallow dish, and is brought up to the pen by capillary action. In the 407, the ink lives in a bottle that is actually at the top of the well, with its opening pointing down. Like the long-term pet-watering devices one might find, some slightly mysterious effect of partial vacuum and differential pressures keeps all the ink from gurgling out of the reservoir once a certain depth is reached in the enclosed dish which constitutes the well’s base. Sticking a pen in the hole at the front of the base simply dabbles the point in the puddle of ink held in the dish, and the ink travels right up it to the inner end of the feed via capillary action. Cutaway from the 1941 catalogue shows the workings. Whether you believe in it or not is up to you. Regarding the feed, I’ll repeat the very words I wrote about the pen on the 444’s page: it is unlike that in a fountain pen as it lacks the air exchange channels. 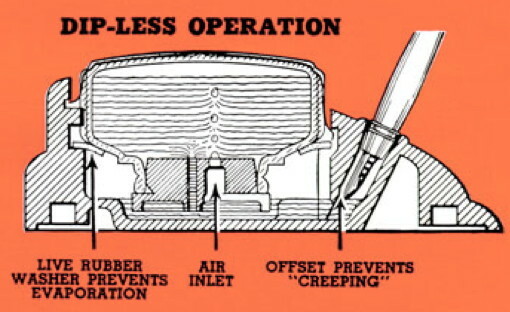 In earlier forms of the “Dip Less” pen, the feed and point were held in place by a little lever, while later models were threaded in such a way that the “Re-New” line of points for fountain pens could also be used. The main difference between these two styles of point and feed, apart from the presence of the all-important channel in the fountain pen models, is that the Dip-Less points and feeds are held together by the barrel while the Re-New points are a unit held together by a threaded collar. Since this well lacks the complexity of the 444, it is a little easier to maintain when cleaning time rolls around; there isn’t the capsule full of rods to deal with. However, refilling is something more of a challenge, as the last stage calls for inverting the bottle and its pierced stopper into the base; some ink unavoidably comes out during this phase. The 407 is also a little less freely portable than the 444, since the hole into which the pen goes is open to a volume of loose ink; in the other, the capillary capsule stands in the way of sloshing. The balance to this slightly higher possibility of disaster is the longer periods that will pass between fillings; the 407 holds more than twice the ink of the 444, which it likely why it remained in production after the 444 appeared. The huge ink supply on these bases made them popular in institutional settings, like banks and hotels; it was essentially incapable of running out of ink in the course of a business day. A variant model, the 408, offered a chain to connect pen to well, suggesting that even in the bygone ages of innocence, people still made away with pens from public settings. If one finds an example of this well which lacks the rubber gasket between base and bottle, it is possible to find a replacement. Pendemonium reveals that the original specs (outside diameter 79 mm, inside diameter 55 mm, thickness 1.6 mm) are met by a Danco Flush Valve Seal, sized for Mansfield #210. While not a household item, exactly, these can be found in plumbing supply shops. Pendemonium gives more specifics at the far end of that link. Production Run: c. 1938- c. 1965 (evidence at both ends is a little fuzzy; hard data is always welcome). Cost When New: The price list for 1941 has it at $2.50 or $2.75, depending on the quality of the point. In the 1957 price list, it was up to $3.50 (for modern value, try this calculator). Point (of pen): Interchangible steel. 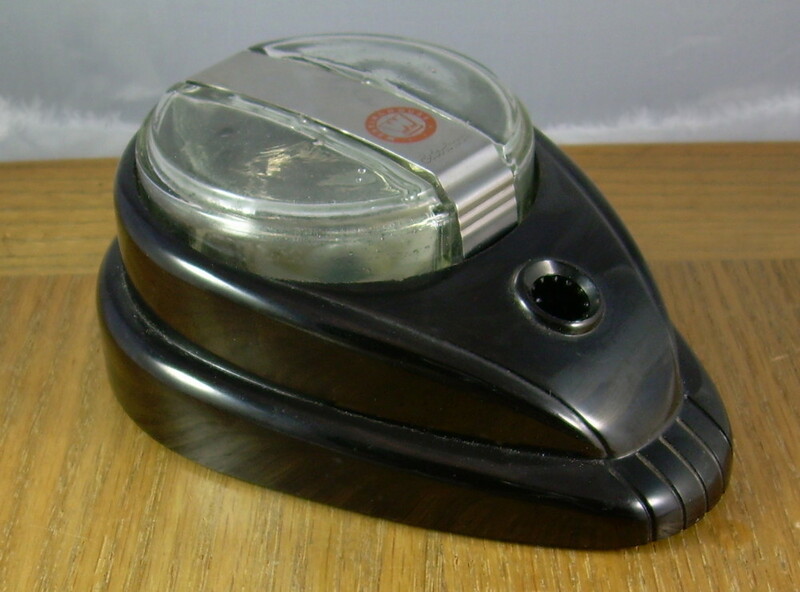 Body (of pen): Celluloid in earlier models, Polystyrene in later ones. Filler: Dip, well capacity approx. 75 ml. Esterbrook 407 well, forlorn without its pen. This one was apparently used by Westinghouse. The metal strap which shows the company name is an anti-spill measure, locking the reservoir bottle in place.